Where do Amish bury their dead? Amish cemeteries are typically located on a plot of land sectioned off from a community member’s farm. In some cases, Amish and Mennonites may share a cemetery. Individuals from the community tend the cemetery, mowing grass and maintaining the fence surrounding it. Gravestones in an Amish cemetery are typically small and simple, listing the deceased individual’s name and date of birth and death, or in the case of the Swiss Amish, wooden markers bearing only the individual’s initials. In many Amish communities, Amish casket makers create simple pine boxes for the deceased. Most Amish make use of funeral homes to embalm the bodies of the deceased. After embalming, the body returns to the home, where it is presented in an open casket for a viewing. Amish funerals take place a few days after an individual’s death. 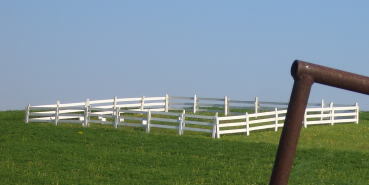 Amish Online Encyclopedia: What is an Amish funeral like? 3 responses to Where do Amish bury their dead? very often because we are all equal in life and dead there is neither the name nor the initial but just a number on the cross or marker. and the Bishop has a map of the cemetery on which one can map the number to the name of the deceased. All of the Amish cemeteries I been to all have Markers with names. Granted some of the realy old ones are only field and unmark, and some are broke, and some are hard to read.I have been to Amish cemeteries in Ohio, Indiana, Pa., and Illinois. The only Amish I know of who do not put at least names, birth, and death dates on grave-stones are the Swiss Amish. Leave a reply to Where do Amish bury their dead?